PITTSBURGH (AP) — Mike Munchak revels in projects such as Chukwuma Okorafor. The Pittsburgh Steelers offensive line coach loves few things more than taking raw talent, particularly talent with an unconventional background, and turning into something far more substantial. The list of Munchak’s protégés includes starting left tackle Alejandro Villanueva, a former Army officer who did three tours in Afghanistan before starting his NFL career. Ditto Matt Feiler, who went undrafted after a career at Division II Bloomsburg, but has forged a path from practice squad flyer to dependable reserve. Now it may be Okorafor’s turn. The rookie third-round pick practiced at right tackle with the starters on Wednesday with Marcus Gilbert still dealing with a knee injury and Feiler — who has made five straight starts in Gilbert’s place — dealing with a pectoral issue. It’s uncertain whether Feiler will be ready to play on Sunday when the Steelers (7-2-1) visit Denver (4-6), leaving Okorafor as the next best option to line up across from Broncos star linebacker Von Miller. 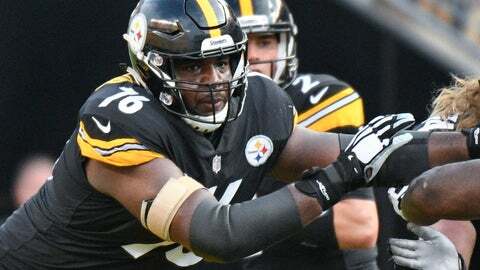 All the 21-year old Okorafor — who was born in Nigeria and spent a portion of his childhood there before moving to the United States at age 12 — may have to do is find a way to keep a six-time Pro Bowler who already has 10 sacks this season from disrupting Steelers quarterback Ben Roethlisberger. Roethlisberger, for his part, doesn’t expect Okorafor or Feiler or whoever might be at right tackle to be able to handle Miller by himself. “Nobody can really block Von Miller to tell you the truth, so we’ll have to put a couple guys over there,” Roethlisberger said. Maybe, but the Steelers like what they’ve seen from Okorafor, whom they took with the 92nd overall pick in the draft after a solid career at Central Michigan. The 6-foot-6, 320-pounder is big but athletic and carved out a role as a blocking tight end in running situations. There’s never any doubt when Okorafor is in the game. Because he wears No. 76, he’s required to check in with the referees when he reports. That won’t happen if he simply lines up next to right tackle David DeCastro. He’s more than happy to enjoy his anonymity and do his job, one that is far different than what he envisioned when the phone rang in April with the Steelers on the other end. Munchak, a Hall of Fame offensive lineman in his own right, likes to turn his players into students of the game. Okorafor is doing his best to be a sponge. “No offense to my coach back in college, but like it’s kind of a whole new level of looking at plays, looking at your technique and every single play,” Okorafor said. Okorafor hardly considers himself the same player he was six months ago, a tribute to Munchak’s approach. Quick to use his sense of humor to get a player’s attention, Munchak has taken a bit of a more professorial approach with Okorafor. It’s working. Okorafor watches film and admits he’s stunned at how far he’s come in six months, all of it a tribute to Munchak. It’s one of the reasons the Steelers have ripped off six straight wins, five of them with Feiler making the first starts of his NFL career in place of Gilbert. Pittsburgh kept humming along anyway. The expectations won’t change if Okorafor jogs into the huddle with the starters in Denver. NOTES: DE Stephon Tuitt (elbow) did not practice. … LB Anthony Chickillo (ankle) was a full participant. … Roethlisberger, CB Joe Haden and C Maurkice Pouncey were given the day off.